X-Men: First class is a fitting addition to the mutant franchise; a movie that is an enjoyable tale in itself, while filling in some of the back-story for the major characters in the earlier movies. While it does have some overly dramatic scenes, typical of comic adaptations, the script feels more like a regular science fiction movie. And that is a good thing, especially after the super-intense X-Men Origins. This episode of the saga feels young, fresh and enjoyable. X-Men: First Class, covers the period in time when mutants were not generally known, and Charles Xavier and Magneto were still young men each coming to terms with their own destinies. Charles Xavier (James McAvoy) is born into a well to do family, and has finished his schooling in London, appropriately majoring in matters related to the mutation of the human genome. Growing up with a young and self-conscious Mystique (Jennifer Lawrence) he has always known there were other mutants in the world, but regards it as little more than an academic exercise, until a fateful meeting with a CIA agent. Meanwhile, Magneto / Erik Lehnsherr (Michael Fassbender) has grown up in a very different world. Living in Nazi concentration camps, and having a doctor take special interest in his abilities, Magneto has grown up with a deep-seated hatred for authority of all kinds and an acute awareness of his difference from all other humans. When the doctor in the Nazi camp Sebastian Shaw (Kevin Bacon) turns out to be a mutant himself, with a goal to push the cold-war era US and Russia into a nuclear war, Magneto and Charles Xavier realize that working together is the only way to stop Dr. Shaw. McAvoy is perfect as the intellectual Charles Xavier, whose naive charm eventually morphs into the hallmark smile of the character. This was one of the strongest characters in the movie, interpreted well from the character to be. Fassbender's Magneto is a distant second; there are aspects of the persona that shine through, but the magnetic persona of Ian McKellen is missing from his younger self. The remaining characters are interesting in their own right, not necessarily as a continuation of the series. Also the question about origins of X-Men technology is answered - much of it was researched on CIA dollar, during the cash-hungry cold war era. It does make ironic sense. Being set during the Cuban missile crisis is presumptuous, even for an X-Men movie, but the script does a remarkable job of pulling it off. There are moments of anachronistic irregularity, but they pass quickly into the background. Stylistically, the movies borrows heavily from the original movies, including actual footage of a young Magneto in the concentration camps (from the first X-Men movie). The training session of the first class of mutants, is one of the more well done comic book looks in any movie. Finally the movie is visually impressive. The initial part of the movie is heavy on the story, leading to the climax of bombs, explosions and two armies standing by. As far as the mythos of the X-Men series goes, First Class is a crucial piece of the puzzle. With a story that deserves to be told, and a cast that is carefully chosen, there is not much that is wrong with the prequel-sequel. 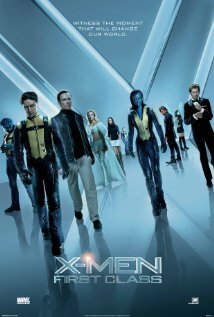 If mutation is something you looked forward to after the original X-Men, this is the movie you would do well not to miss.